Senior Portrait Sessions, We’ve Got Your Style! Why do we call our senior portrait photography, Senior Style Sessions? Because we love to incorporate your Style and your Personality into your Session. Are you the strong silent type that likes your images to be BOLD and artistic? Do you prefer a more BASIC or traditional look in your portraits? Are you all about showing your natural BEAUTY? Whichever style you prefer: BOLD – BASIC – BEAUTIFUL We’ve Got Your Style! Tell us how you dream to be photographed and let us make it a reality. 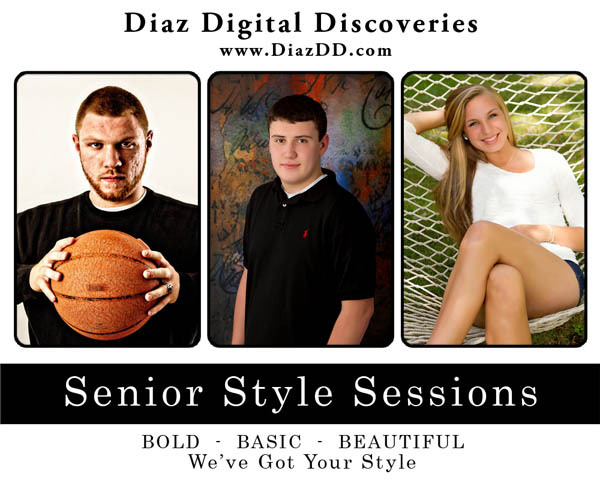 Book your SENIOR STYLE SESSIONS at Diaz Digital Discoveries. Class of 2013. With Senior Portrait Season now in full bloom, we want to ask you this. What’s your Style? How would you like to be photographed? Here at Diaz Digital Discoveries, portrait photography is one of our specialties. We photograph our Seniors, the way that they want to be photographed. Our portraits incorporate each Seniors own style and personality, plus a little creative kick by us to make each photo stand out from the rest. So whether you prefer a Traditional portrait, something more like a Fashion portrait or perhaps a Themed portrait that incorporates one of your hobbies or school activities, we will create that perfect portrait that shows the side of you, you want to share with your classmates, friends, family and the world. Book your Senior Style Session with us during the month of August and we will include a Free Facebook Profile Pic and Timeline Cover Photo with every portrait package ordered. Plus, you will also get a coupon for a Free Family Portrait session, with one whole year to use it. But hurry! We only have limited dates in August available for our Senior Style Sessions. Contact us today at: info@DiazDD.com or call 508-216-5898 to book your no cost pre-session planning meeting, where we will talk about hair, makeup, outfits and how to prepare for your Senior Style Session. Class of 2013. Contact us today to book one of our Senior Style Sessions. Our Senior Portraits are unique and incorporate your own style and our creativity. Our Senior Portraits are unique and incorporate your own style. Come in for a pre-session planning meeting and together we can create some amazing images you’ll be glad to show off to your classmates.